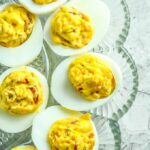 Step up your deviled egg game with bacon and cheddar cheese! Halve each of the eggs from end to end. Remove the yolk and place in medium sized bowl. Pulverize the yolk and mix in the remaining ingredients: bacon, mayonnaise, mustard, and cheddar cheese. Stir until the the mixture appears smooth and ingredients are evenly distributed. Taste the yolk mixture and add salt and pepper to taste. If you prefer a creamier mixture, take this opportunity to fine tune the taste and texture by blending in more mayonnaise. Fill the wells of the egg whites with the yolk mixture. I've found it is easiest to spoon the yolk mixture into the wells. Using a piping bag can be difficult, as the bacon pieces easily clog the flow. Arrange on a serving platter or storage container.